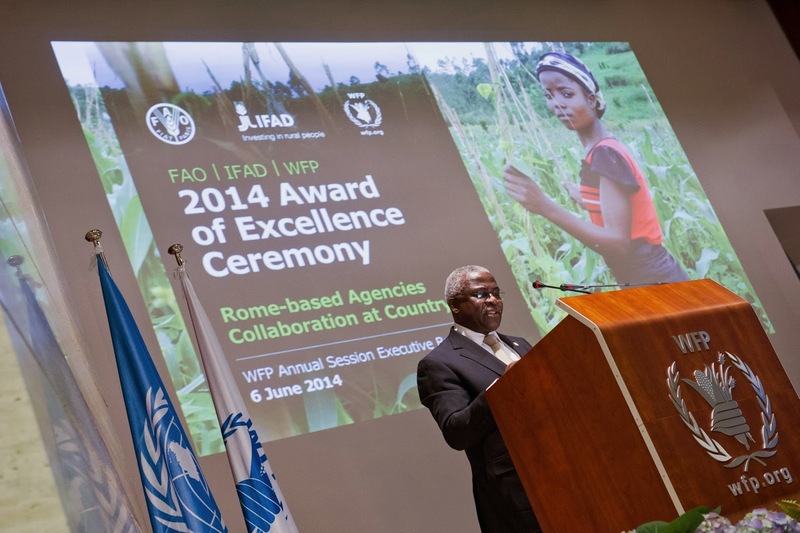 The collective efforts of the three UN food and agriculture agencies in the Democratic Republic of Congo (DRC) have been recognised in the 2014 Award of Excellence by the United Nations Food and Agriculture Organization (FAO), the World Food Programme (WFP) and the International Fund for Agricultural Development (IFAD). 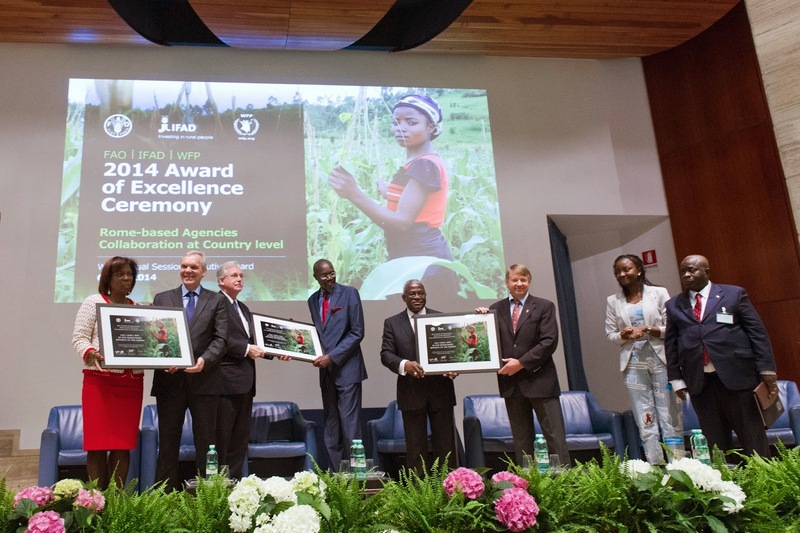 The award ceremony took place on Friday, 6 June, 2014 in Rome, during an official session of WFP’s Executive Board. The three Rome-based agencies, which share the goal of increasing food security, play an important role in the agricultural policy in DRC. They cooperate in political dialogue and sector coordination as well as in strategic planning, formulation and implementation of projects. The agencies make regular efforts in pooling their expertise on agriculture, food relief and rural development. Their teams work closely to support DRC in its efforts to ensure food security and agricultural development, mainly in the provinces of North Kivu, South Kivu, Orientale (Tshopo, Ituri, Haut and Bas-Uélé districts), Northern Katanga (Manono, Mitwaba and Pweto), Bandundu, Bas Congo and Kinshasa outskirts. The Consortium is also active in the effective coordination of support from various technical and financial partners in developing strategies and programmes for agricultural development, including the National Agriculture Investment Programme (NAIP), one of the key results of the Comprehensive Africa Agriculture Development Programme (CAADP). In this field, the Consortium builds on the experience of the Belgian Cooperation Agency. In November 2013, the Consortium supported a NAIP business meeting for fundraising, after supporting its formulation, finalization and validation process. In January 2014, with the technical and financial partners’ support and following the recommendation of the New Partnership for the Development of Africa (NEPAD), the Consortium started working with the Government on a consultation process, which should ultimately lead to the development of a common roadmap on the improvement of governance in the agricultural sector. IFAD’s Country Portfolio Manager, Rasha Omar, recognizes that "the honour in obtaining this award is also due to the efforts of all three agencies’ staff across DRC, who give themselves heart and soul to the fight against food insecurity and rural poverty".